The organization has one Council, one Rector, one Academic Committee, one Executive Committee and a number of functional sub-departments. Besides, the University works closely with other United Nations divisions and agencies to improve collaborations. 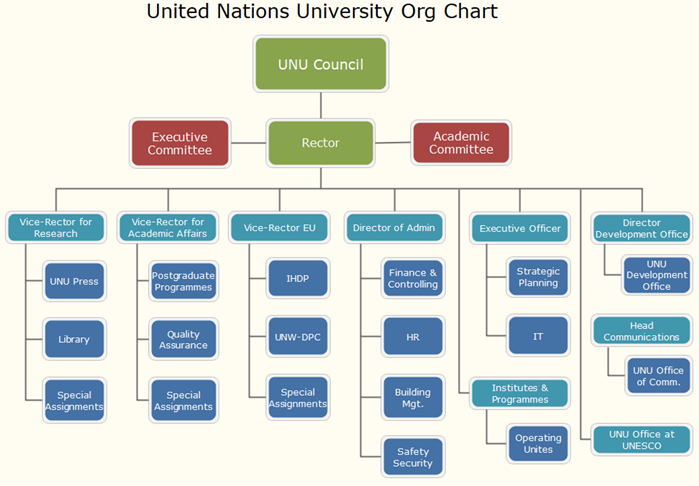 The UNU Council acts as the top management board of the United Nations University. So far, the Council has 12 official members as individual capacities. Overall, the Council is in charges of policies and financing programmes that govern the whole UNU’s daily operations. For normal issues, the party reports to the UN General Assembly and the Economic and Social Council on a regular basis. This Office plays the most dominant role in dealing with academic and administrative activities within the United Nations University. The Office also helps to handle some executive management issues and offer suggestions on policy-making, legal affairs and some other topics related to governance. These 13 research and training institutes form the majority of the United Nations University. Currently, there are in total 12 member countries involved in the research and training activities. All of these institutes are led by the UNU Centre, which is located in Tokyo, Japan. Some other important and noticeable institutes include topics like the Comparative Regional Integration Studies, the Globalization, Culture, Mobility, the Economic and Social Innovation and Technology. What Software Should I Use to Draw an United Nations University Org Chart? Let this easy org chart creator article to guide you the right pathway. Besides, feel free to use this easy org chart creator for more advanced settings and management of your business teams.